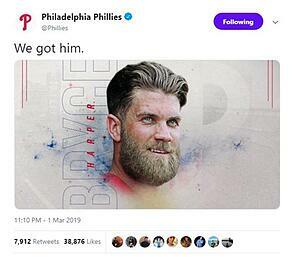 As the world now knows, Bryce Harper is a Philadelphia Phillie. The former MVP and six-time All-Star agreed on a 13 year, $330M deal – the richest contract in Major League Baseball (MLB) history. Other offers came from the San Francisco Giants and Los Angeles Dodgers, both of which hail from California, land of the 13.3% state income tax. In today’s blog, you’ll see the differences the PA and CA tax rates create, and how many millions Harper gets to keep by signing with Philadelphia. The Giants offered $310M over 12 years and the Dodgers offered $168M over four years. Though both offers were incredibly lucrative, the IRS and California would have taken big handfuls of cash out of Harper’s wallet. The chart below shows, approximately, how Harper’s contract could have been impacted by all deals. *Table assumes the income tax rate doesn’t change during the life of the contracts. As you can see, Pennsylvania’s modest 3.07% tax rate, along with Philadelphia’s 3.46% non-resident tax rate, are far below California taxes. It is, roughly, a $24M difference in net wages between the Phillies and the next closest bidder, the Giants. The Giants would have had to increase their offer to roughly $340M to match the net wage amount Harper will receive from the Phillies. Furthermore, the table above does include the “Jock Tax” that is levied against visiting players to a city or state who earn money within their jurisdiction. The players’ income is taxed at the state’s tax rate where the athlete is playing or even practicing their sport. This eats even further into a players’ net wages. Another component of the agreed-upon contract is the $20M signing bonus. This was a non-factor regarding tax implications, but it could have played a big part had Harper, a Nevada resident, signed with one of the California teams. Pennsylvania happens to be one of the few states that always levies taxes on a true signing bonus. Had Harper signed with one of the California teams, where they do not tax true signing bonuses, he could have negotiated a good chunk of his contract into a signing bonus that would have avoided the high CA tax and taken it in the tax-free state of Nevada, where he resides. Speaking of residency, Harper must navigate the choppy waters of statutory residency. In Pennsylvania, an individual (1) whom maintains a permanent place of abode in PA and (2) does not spend over 181 days outside of the Commonwealth will be taxed as a PA resident – taxed on all income regardless of where it was earned. Ok, but what is a permanent place of abode? An abode is a house, apartment, or other building maintained as a dwelling place. An abode is permanent if it is maintained as a dwelling place for an indefinite period, whether the occupants own it or not. An abode that is occupied only during a fixed or limited period for a particular purpose is not a permanent abode. For those of you scoring at home, that last sentence would probably be the most efficient way of avoiding PA statutory residency. Rather than owning a home in PA, Harper might want to look into short-term, fixed lease agreements, thus he would not maintain a permanent place of abode for PA tax purposes. Ultimately, it seemed the main goal for Harper and Boras Corp. was to set the new bar for MLB contracts with a record-breaking deal. Thanks to John Middleton and the rest of the Phillies ownership, they were able to do just that. Welcome to Philadelphia, Bryce. We look forward to many winning seasons with you on board. And, if you ever need tax planning to help you sustain and grow your wealth, call on The Tax Warriors® at Drucker and Scaccetti. Our Athletes and Entertainers Group Practice is highly skilled and recognized for its ability to hit it out of the park!